Zegna president Paolo Zegna, left, with superfine trophy winners Angie and David Waters. Image – Karon Photography. 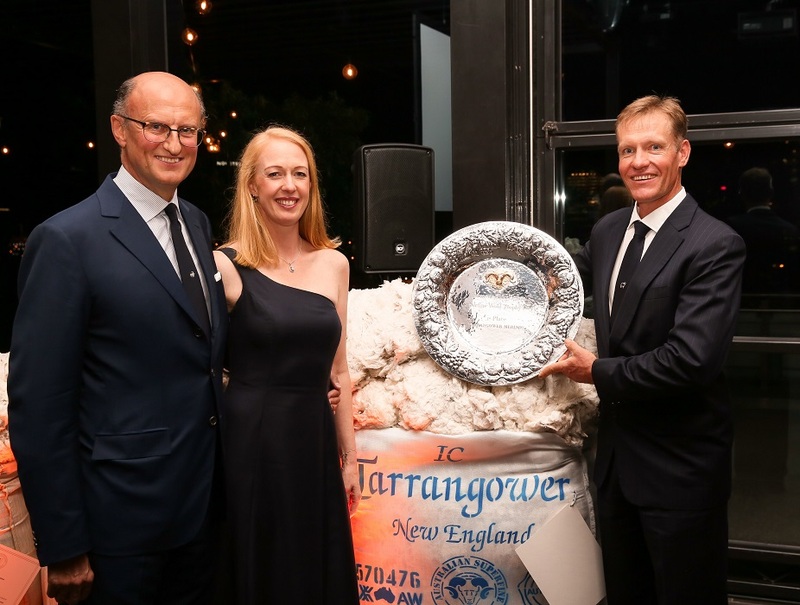 NEW SOUTH Wales wool growers David and Angie Waters have won the prestigious Ermenegildo Zegna Superfine Wool Trophy for the third consecutive year with a 15.2 micron bale produced under difficult conditions. In the other major Zegna award presented in Melbourne last night, south-west Victorian growers the Rowbottom family have won their fifth Vellus Aureum Trophy with a 10.2 micron Rowensville Merino fleece. The Waters’ 130kg Tarrangower Merinos winning entry of wether wool was produce in a difficult season at their northern tablelands Hillgrove property last year. However, the couple’s management and wool selection skills still managed to produce a paddock-grown bale with impressive statistics; including a yield of 74.8 percent and tensile strength of 53 Newton/kilotex. The judges gave it 94.87 points out of 100 for micron, yield, strength, length conformity and trueness to type. “It’s very unexpected, but we’re just ecstatic after all the hard work, given the tough seasons that we are having,” Mr Waters said. “We’ve fed out more grain than we ever have – we pretty much fed from April right through till Christmas time. The Waters were paid a premium – 50pc above market value – for their winning bale by Zegna last year. But this is in stark contrast to the on-farm situation, with another grain silo delivered last week ready for the next B-double of grain. Mr Waters said his pasture and feed budgets would mean “a massive deficit” and they urgently needed rain. Mr Waters said the Zegna win would keep them motivated to continue to produce the best quality wool they could. “I know wool prices are at all-time highs, but the ultrafine end isn’t receiving the premiums that it might over the best topmaking-style wools. “The parity between good wools and great wools still isn’t there,” he said. Mr Waters said the bale was produced from “commercial sheep that do the job,” classed, selected and prepared by the couple. “I love it to bits, it’s not for everyone, you’ve got to want to do it. “My wife and I run the operation and we’ve got our finger on everything and you can do that if you do that yourself,” he said. Second place in the Zegna bale award was won by Allan and Carolyn Phillips, Glen Stuart, Deddington, Tasmania, and third place went to Ed Hundy, Windradeen, Mudgee-Pyramul, NSW. Two other Tasmanian operations, Rose Villa at Ross, Snowhill at Avoca and Macquarie Hills at Longford were among the finalists for the first time. St Helens ultrafine sheep breeder and wool producer David Rowbottom was today getting fitted for his first Zegna suit after Ermenegildo Zegna Group president Paolo Zegna presented the Vellus Aureum Trophy to him and his wife Susan Rowbottom,. Their son Aaron and daughter-in-law Rebecca Rowbottom from Myndarra at Orford placed second and third place went to Robert McClenaghan from Rockvale North at Armidale, NSW. Mr Rowbottom said the 10.2 micron fleece scored 91 points out of 100 to give them their fifth win in six years, along with three second and one third placing in the past nine years. “We were second last year and previous to that it was four wins in a row. “It’s hard to describe the feeling of it,” he said. The finest fleece ever entered by the Rowbottoms was a winning unbeaten world record 9.9 micron entry in 2016. 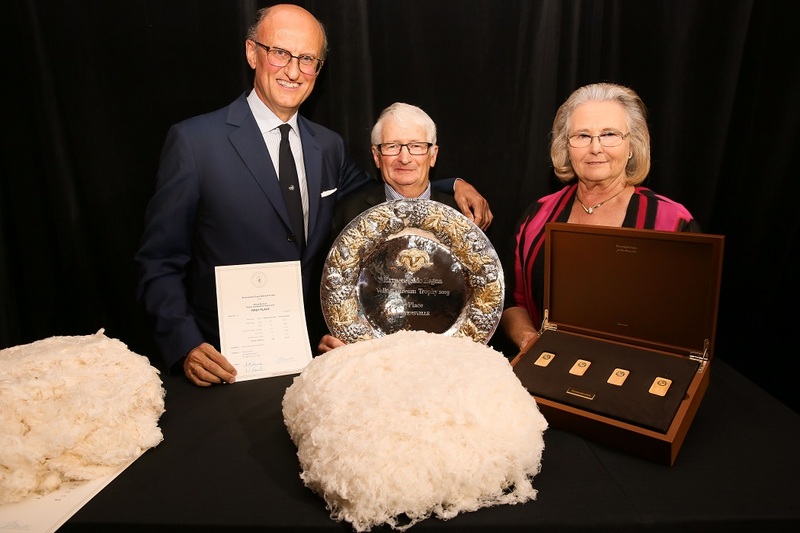 Ermenegildo Zegna said the 56th edition of the prestigious Superfine Wool Award program this year made it the oldest in the world of wool and represents, for Australian and New Zealand growers, the Oscars for the best wool in the world. The Vellus Aureum Trophy was started in 2002 to recognize excellence among the finest woollen fleeces measuring 13.9 microns and finer. The wool growers were awarded by Mr Zegna during a dinner held at Luminaire in Melbourne. “We’ve been honouring the best quality wool for over 50 years now and especially this year, the results of the Ermenegildo Zegna Wool trophies are excellent, not only in terms of number of farms participating the competitions, but also in terms of the high quality achieved despite having very difficult weather conditions with persistent and tough drought, which harmed some areas of Australia,” Mr Zegna said. “For this reason, on behalf of the Ermenegildo Zegna Group, I would like to congratulate not only the winners but all the farms involved in the competition. “A deep personal thanks goes also to the Australian Superfine Wool Growers’ Association for its great commitment to support the participation of its members to our competitions,” he said. All fleeces and wool lots entered in the two competitions are purchased by the Zegna Group. A further severe selection of the best of them is transformed into the top line fabrics and finished products of the Ermenegildo Zegna collections.